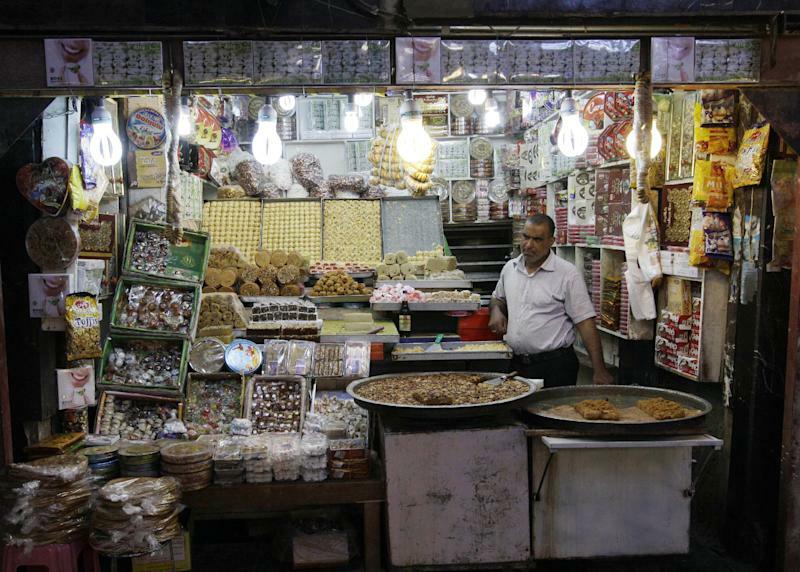 NAJAF, Iraq (AP) — The plunge in Iran's currency is proving bad for business in neighboring Iraq. Yousif Jassim Mohammed would know. The Iraqi merchant's gift shop sits on prime real estate opposite the gold-domed Imam Ali shrine in Najaf, one of the holiest sites for Shiite Muslims and a huge draw for the busloads of Iranian pilgrims that form the bedrock of Iraq's tourist trade. Not long ago, the 60-year-old father of three could count on selling $1,000 worth of silver jewelry, prayer beads and trinkets a day. Now far fewer Iranians are passing by, and those who do come are holding tight to their cash. Mohammed says he's lucky to make a tenth of what he used to. "Unlike before, they're now bargaining down to their last breath," Mohammed said of his remaining Iranian customers. "The sanctions have hit their economy very badly, and that is being reflected back on us." The Iranian rial has plummeted in value against the dollar over the past year, with the slide accelerating over the past month. The drop is blamed on Western-led sanctions targeting Iran's suspect nuclear program but also on government mismanagement by Tehran. The steep decline is painful for ordinary Iranians, who now have to pay far more for imported goods. But it is also damaging Iraq's fragile tourism industry, pinching small-time entrepreneurs and forcing businesses to lay off workers. Fewer Iranians are able to afford visits to Shiite holy sites here and elsewhere in Iraq because each dollar or Iraqi dinar now costs roughly three times what it did as recently as last year. That has pushed the price of organized tours up sharply and made Iraqi merchants far less willing to accept rials as payment. "It's more expensive now because of the (currency) problems we are facing," said Nakhi Morteza, 56, a pilgrim from Tehran who was helping lead a tour group outside Baghdad's Kazimiyah shrine this week. Even some Iraqi money changers are refusing to accept Iranian banknotes, saying they have little use for a currency that is so volatile. Tehran's state-run pilgrimage company owes Iraqis about $75 million in unpaid bills that have piled up since last year, according to Mahmoud Abdul-Jabbar al-Zubaidi, the head of the tourist department at Iraq's Ministry of Tourism and Antiquities. That has prompted some of Iraq's biggest travel agencies and several hotels to stop accepting Iranian pilgrims altogether until the payment dispute gets resolved. Iman Rasool Nima, who runs the Janat al-Firdous hotel outside the Kazimiyah shrine, said she stopped taking in Iranian pilgrims two months ago after tour groups racked up $50,000 in unpaid bills. She is now focusing on attracting Shiite pilgrims from Arab countries such as Bahrain and Saudi Arabia instead. Iranian pilgrims account for about 95 percent of Iraq's tourist trade. "The Iranians make up the bulk of our business. ... So of course our business is down," she said. The head of one large Iraqi travel agency in Najaf said he is owed $5 million by the Iranians and won't be accepting any more pilgrims from the Islamic Republic for now. The businessman, who declined to be named because he is still in negotiations about the unpaid bills, expects to lay off 35 of his 75 employees by the end of this month because of the lost Iranian customers. Like others in the industry, he is insisting on being paid in dollars rather than rials. "It is like committing suicide for any merchant in Iraq to deal in a fluctuating currency like rials today," he said. Officials at Iran's Hajj and Pilgrimage Organization, which arranges trips to religious sites abroad, refused to comment. But Iranian media quoted several officials earlier this month as saying that the cost of travelling to Iraq has doubled. The acknowledgement came days after Iran's currency lost nearly 50 percent of its value in early October. About 3,500 to 4,000 Iranian pilgrims had been traveling to Iraq daily before the rial's collapse, according to officials in both countries. Iraq's tourism ministry has not recorded a drop in pilgrims so far, al-Zubaidi said. But business owners and local officials in pilgrimage centers tell a different story. Saeeb Abuqneem, who owns the al-Farqadain hotel in Najaf and heads the city's hotel association, estimates that the number of Iranians visiting Iraq has dropped to about 2,500 per day. He says he's able to fill only about 10 percent of his rooms these days and he has begun laying off employees. Several of the remaining uniformed staffers sat around the lobby looking bored during a recent visit. "It's really bad. The private sector needs some kind of support from the government. But here in Iraq, we are paralyzed," he said. Hotel owners and restaurants in nearby Karbala, where two revered Shiite saints are buried, have similar concerns, officials there say. Like elsewhere in Iraq, some business owners are effectively boycotting Iranian tour groups until the payment issue is resolved. Some establishments will likely have to shut down if the crisis continues, said Mohammed al-Hir, who heads Karbala's hotel and restaurant association. "The situation has hurt Karbala's economy," said Tareq al-Khegani, a member of the provincial council in Karbala. "The unemployment rate has risen. ... Most of the hotels and restaurants are empty." In Najaf's old market, the mood is heavy. 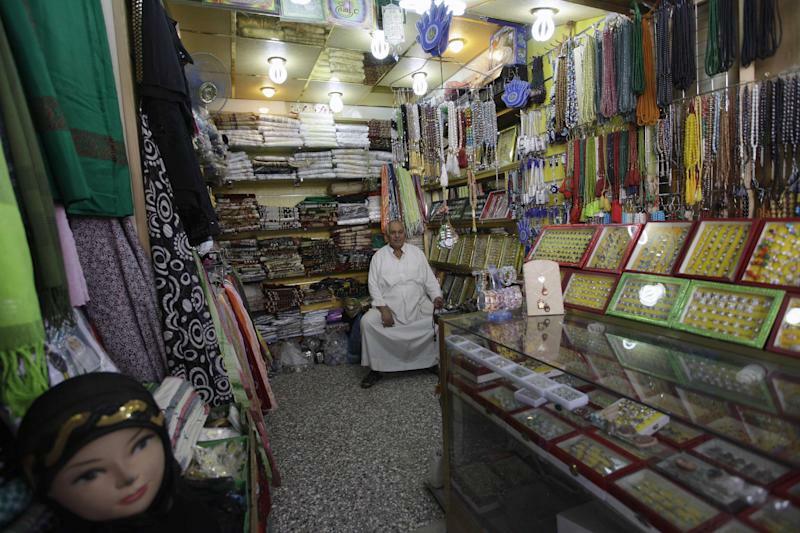 Hussein al-Hamiri, a 31-year old owner of a textile and souvenir shop, said he now sells mostly to Iraqis and the small number of pilgrims who visit from other countries. He estimates business is down nearly 90 percent since the rial plunged. "The market today is stagnant," he said. 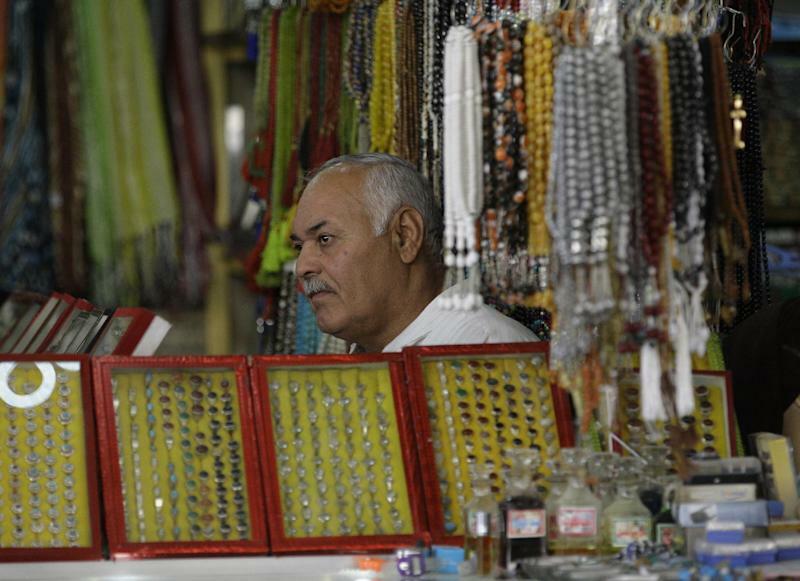 Nearby, one of the few Iranian pilgrims in the market started examining a necklace in his hands. When the merchant mentioned the price, the Iranian raised his eyebrows in surprise, dropped the piece immediately and quickly walked away. Associated Press writers Sameer N. Yacoub in Baghdad and Ali Akbar Dareini in Tehran, Iran contributed reporting.